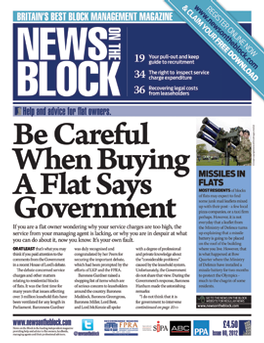 News on the Block is the leading publication in the United Kingdom providing help and advice about flats.We provide specialist help on matters such as troublesome neighbours, service charges, lease extensions, buying your freehold, health and safety, maintenance ... in fact if there is any question a flat owner needs answering News on the Block will have the answer.We distribute 10,000 print copies of News on the Block six times a year. Each magazine is individually addressed and delivered by Royal Mail directly to our readers. Be the first person to tell us what you think about News on the Block and you'll save £2.50 on your next purchase!